Zoom-Ex is the seamless integration of an instant scanner and a lightning fast OCR. It allows you to convert any printed text into multiple accessible formats like speech, large print, sound file, text file, etc. –within seconds. Zoom-Ex is extremely easy to use, too: the foldable stand holds a digital scanning camera that is always at the exact distance needed to create a clear image. Low vision users know exactly where to place the material to be read because they can touch and feel L-shaped edges of the stand. Instant Reader: It’s the world’s first instant book-to-speech tool—our proprietary OCR software provides lightning fast performance for real-time page-to-speech. Click here for more information. 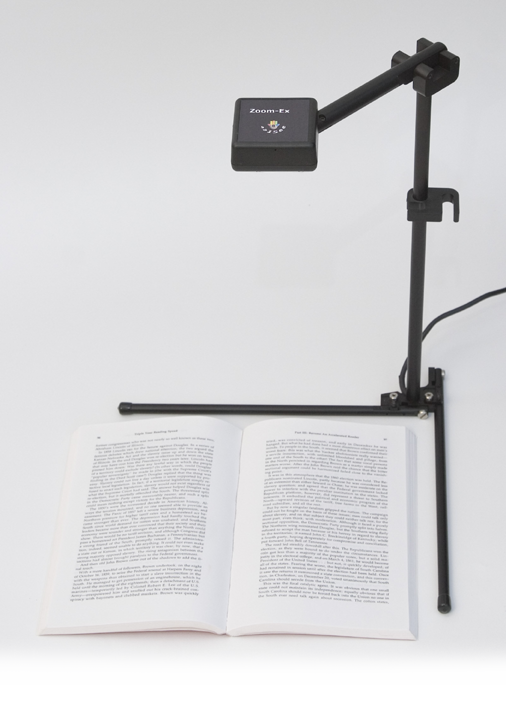 Smart Magnifier: It’s a magnifier that eliminates the need for an X-Y table and delivers text wrapping on screen for easy reading. Click here for more information. Book Scanner-Reader: It’s a fast 20ppm scanner (allowing you to keep books bound and intact) that provides you with OCR. Click here for more information. Always Handy: Zoom-Ex folds up and fits in your laptop bag.